Kevin Wirth has an odd, yet fun, assignment in front of him: hunt and hook a single bass worth $1 million — not to him, but to his fishing partner for the day, Michael Skidmore of Chicago. Skidmore won the right to claim the prize — if it materializes — through an Early Times sweepstakes. He also won a seat in the boat with Wirth to help catch the million-dollar fish. The tag-team attempt is slated for Sept. 25 on Lake Erie out of Buffalo, N.Y.
Actually, 25 tagged bass were released by Early Times into Erie, but only one carries the top award of $1 million. Another tagged fish is worth a Triton bass boat to Skidmore. The other tags are good for gift cards or fishing gear. Skidmore is already a winner. 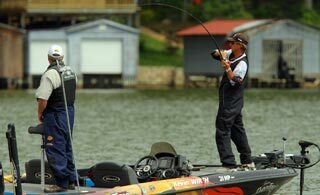 He gets to go fishing for a full day with a top Bassmaster Elite Series pro, whose recent accomplishments include qualifying for his 12th Bassmaster Classic, coming up Feb. 18-20 on the Louisiana Delta out of New Orleans. (That’s when Wirth will get his shot at a big prize: a coveted Classic crown.) Skidmore also won a rod, reel and tacklebox, plus his travel to and accommodations in Buffalo. "Everyone at Early Times is thrilled to have Michael as our sweepstakes winner and hope he and Kevin have a million-dollar day on the water," said Joe Murray, Early Times brand manager. This is the fourth year for the Reel in a Million contest with Wirth, who is sponsored by Early Times. No one boated a tagged fish in the previous three years. “We definitely would love to give the million away. Hopefully, this is the year,” said Svend Jansen, Early Times spokesman.